“She was our first loss April 1 2011. June 28, 2008. I went into the pet store to pick up some cat food (yeah- I know), and asked about the ferret kits, as usual. We’d only had Boris and Vincent at that time for around 3 and 6 months. The clerk brought me this tiny curled up ball of fluff and put her in my hands. This tiny fuzz gave this big long stretch and yawn, lay there looking up at me, then immediately jumped up and started giving me kisses all over my face, neck, and arms. I then found out she’d been surrendered by her owner due to the fact they’d had to move, and it was a pet free apt. She’d obviously been well loved, because she was so very affectionate. We found out later she was that affectionate with anyone and everyone ;D .
That pair became strongly bonded, likely because of this. When we brought Lucrezia in as a tiny kit at all of 13 weeks, Boris tried bullying her, but Sinnead wouldn’t let him. She’d actually get between them, hissing, then turn and groom the baby ;D We brought in Willow, and tried introducing them – didn’t go so well. I’d read about putting some tone on each ferret so they’d start grooming each other, thus starting to bond. Well- Sinnead decided that made Willow something she really wanted, so she tried to stash her ;D Didn’t go over so well, especially as Willow was still frightened of other ferrets. The first autumn we had her, she had what we thought was a “funky” shed. Lost the tail hair near the top of her tail. Talked to the vet who said it might be adrenal, but we all decided to hold off til spring and see if her fur came back. It didn’t. So…she was started on lupron in March of 2009. Fast forward to today, Friday April 1st. It’s taken me a while to be able to write this. Boris was my best bud. My bubbaboy. My friend. January 2007. I was helping to clean a house. As I walked to the bathroom to clean it, I saw this wee tiny face peering out from between the bars of a cage, like a little felon, paws gripping the bars while standing on the hind legs. Such a sweet looking thing. 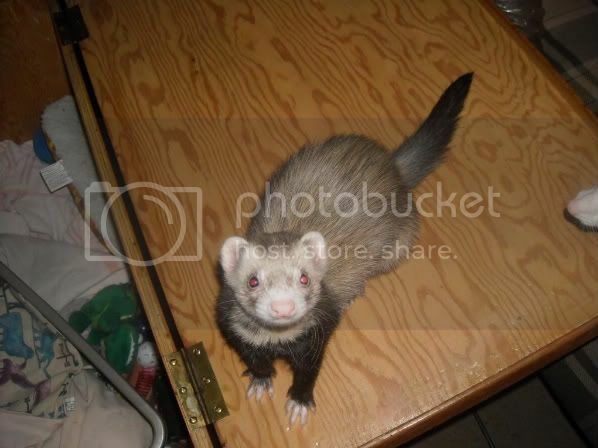 I asked about him, and was told by the owner’s mother that her daughter had begged and pleaded for a ferret, and asked me if I wanted him as her daughter had decided this tiny baby was too much effort. I told her “no”. I had 4 cats and a dog at that time, and didn’t need, nor want another animal. Couldn’t frankly afford it either! However, every time I passed the room he was housed in, he would immediately stand up, grasp the bars, and look at me. J asked me if I wanted to see him. Of course, I said “yes!”. We took him out of his cage and played for a time. Dancing and dooking like you would not believe, the ferret who finally got the name Boris kept trying to get me to play with him. Finally, I talked to Cliff about the possibility of bringing this unwanted little fuzz home. Which we did the following weekend. Cage, food, toys, box, everything free. Yeah, right! Free. Anyway- I’d picked up a bunch of reading material to give this wee mite the best life we were able to. The biggest tip we recieved from the previous owner, and the books, was to “flick” the nose when he would nip. And the harder he bit, the harder we were to “flick” his nose. This wound up turning a wee baby into a major fear biter. :'( He would actually lunge at us and bite. Hard. Drew blood several times. 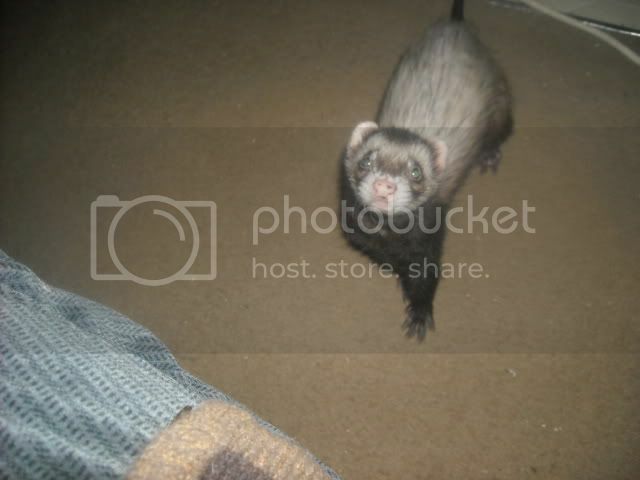 But- we’d promised to give him a “forever” home, so I found a ferret forum, and realized where we’d gone wrong with the nose flicking. We stopped, and it took another 10 months before Boris started to trust again. He became, finally, a “momma’s boy”. During the interim, Cliff purchased Boris’ brother Vincent from the petstore. The reunion was amazing to see ;D When Sinnead came in, they FOUGHT! Like you would not believe. Boris was determined this little 4+ yr old girl was going to submit. She was equally determined she wasn’t going to ;D . It took 3 weeks for them to finally come to some sort of arrangement. Long and short of it? They became so closely bonded that we almost lost him when Sinnead finally passed. That’s when his IBD ran riot. He very quickly became “my” boy! If Cliff teased him he’d come running for momma. I was his snuggle buddy, his safety net, and his friend. We finally received his ashes back today, so I could finally write his story. I truly hope you can see what a bright star my baby has been in my life, and how much trouble he is now causing at the bridge.